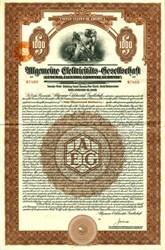 Beautifully engraved $1000 Bond certificate from General Electric Company, Germany issued in 1925. This historic document was printed by the American Banknote Company and has an ornate border around it with an image of an allegorical man. This item has the signature of a Company officer and is over 97 years old. 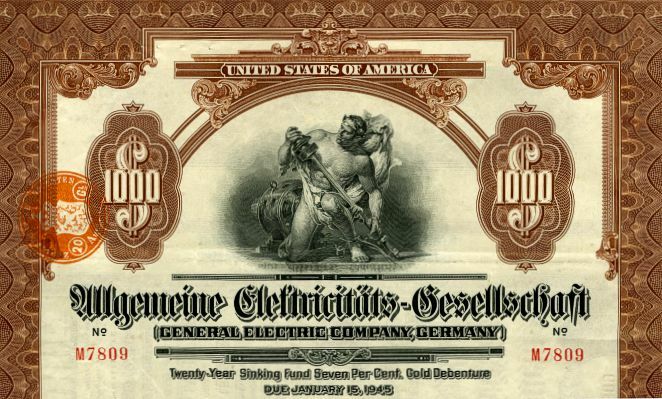 Allgemeine Elektricitäts-Gesellschaft (AEG) (German: "General electricity company") was a German producer of electrical equipment founded in 1883 by Emil Rathenau. In 1967 AEG joined with Telefunken creating AEG-Telefunken. In 1985 AEG was bought by Daimler-Benz, later being wholly integrated into DaimlerChrysler forming part of Adtranz. By 1997 the company no longer existed. After acquiring the household division of AEG in 1994, in 2005 Electrolux bought the rights to the brand name AEG and now uses it on some of its products. As of 2009 the AEG name is also licensed to various companies. AEG (Slogan: "Aus Erfahrung gut") was created in 1887 from the Deutsche Edison Gesellschaft (DEG), initially the company produced electrical equipment - light bulbs, motors and generators etc., it soon became involved in AC electrical tranmission systems. In 1907 Peter Behrens was appointed as artistic consultant to AEG. This led to the creation of the company's initial corporate identity, with products and advertising sharing common design features. The company expanded in the first half of the 20th Century and is credited with a number of firsts and inventions in the electrical engineering field. During the same period it entered the automobile and airplane markets. Electrical equipment for railways was also produced during this time - starting a long history of supplying the German railways with electrical equipment. After the black period of the Second World War the company lost those businesses located in the eastern part of Germany. In 1967, after a merger, the company was renamed AEG Telefunken. The company experienced financial difficulties during the 1970s resulting in the sale of some of its assets; in 1983 the consumer electronics division was sold and the company re-took the name AEG. In 1985 the remainder of the company was acquired by Daimler-Benz; the parts that remained were primarily related to electric power distribution, and electric motor technology. Under Daimler Benz ownership the former AEG rump companies eventually become part of the newly named Adtranz in 1995. In 1996 AEG as a manufacturing company ceased to exist. The origins of the company can be traced to 1882, when Emil Rathenau who had acquired licences to use some of Thomas Edisons lamp patents in Germany. [chron 1] The Deutsche Edison Gesellschaft ("German Edison Company") was founded in 1883 with the financial backing of various banks and private individuals, with Emil Rathenau as company director. In 1884 the Munich-born engineer Oskar von Miller (who later became the founder of the Deutsches Museum) joined the executive board. The same year the company entered negotiations with the Berlin Magistrat (the municipal body) to supply a large area from a central supply, which resulted in the formation of the Städtische Elektricitäts-Werke AG zu Berlin (AGStEW) ("City electricity works company (Berlin)") on 8 May 1884 - this date is considered to be the birthday of the German electrical industry. The original factory was located near Stettiner Bahnhof. In 1887, the Company acquired land in the Berlin-Gesundbrunnen area on which the Weddingsche Maschinenfabrik (founded by Wilhelm Wedding) was previously located. In the same year, in addition to a restructuring and expansion of the production range the AEG name was adopted. In 1887 Mikhail Dolivo-Dobrowolsky joined the company as chief engineer, later becoming vice-director. His work on polyphase electric power led him to become the world's leading engineer in 3 phase electric power systems at the end of the 1880s. In 1891 Miller and Dobrovolski succeeded in demonstrating the transmission of electrical power over a distance of 175 km (109 mi) from a hydro electric power plant in Lauffen am Neckar to Frankfurt, where it lit 1000 light bulbs and drove an artificial waterfall - at the International Electrotechnical Exhibition in Frankfurt am Main. This success marked one of beginnings of the general use of alternating current for electrification in Germany, and showed that distance transfer of electrical power could useful economically. Additionally, in the same year the Stadtbahn Halle/Saale (City railway Halle - Saale) is opened - being the first electric tram system (of notable size) in Germany. Tropp Paul began his work for the AEG 1889/90 until 1893, and Franz Schwechten designed the facades of the Acker- und Hussitenstraße 1894-95. In 1894 the site of the former Berlin Viehmarktgasse (cattle market) was purchased. This had a siding connecting to the Berlin rail network produced, but there was no rail connection between the two plants - therefore in 1895 a link between the two plots was built as an underground railway in a specially designed tunnel of 270 meters in length. The tunnel was implemented by Siemens & Halske (S & H) (later to become Siemens) under the direction of C. Schwebel and Wilhelm Lauter - this is now the Spree tunnel Stralau - used by public transport. In 1907 the architect Peter Behrens became an artistic adviser. [chron 8] Responsible for the design of all products, advertising and architecture, he has since become considered as the world's first corporate designer. A number of other notable events involving AEG occurred in this period: 1900 - Invention of the hairdryer. 1901 - The Neue Automobil Gesellschaft ("New Automotive Company") became part of AEG through the takeover of Allgemeine Automobil-Gesellschaft[chron 10] 27 October 1903 - A three-phase AC AEG motor in a competition with Siemens & Halske achieves a speed of 210.2 km/h (131 mph) on the test track of the Königlich Preußische Militär-Eisenbahn (Royal Prussian military railway) between Marienfelde and Zossen. This world speed record for rail vehicles was held until 1931. [chron 7] 1904 - Merger of AEG with the Union-Elektricitäts-Gesellschaft (UEG) (literal: Union-electricity Company) 1910 - Entry into the aircraft building market. [chron 11] 1929 - AEG produces its first compressor driven fridges and temperature controlled irons. [chron 12] 1935 - Presentation of the world's first tape device Magnetophon K1 based on work by Eduard Schüllerat the Berlin International Radio Exhibition [chron 13] 1941 - AEG buys Siemens & Halske shares in Telefunken and the company becomes a subsidiary. AEG donated 60,000 Reichsmarks to the Nazi party after the Secret Meeting of 20 February 1933 at which the twin goals of complete power and national rearmament were explained by Hitler. During World War II, an AEG factory near Riga used female slave labour. AEG were also contracted for the production of electrical equipment at Auschwitz concentration camp. AEG used slave labour from Camp No. 36 at the new sub-camp of Auschwitz III called "Arbeitslager Blechhammer". Most of these would die in 1945 during the death marches and finally in Buchenwald. In 1945, after the Second World War, the production in the factories in the western sectors of Berlin and Nuremberg, Stuttgart and Mulheim an der Ruhr resumed and further new works were erected, among others an Electric meter plant in Hameln. The steam and electric locomotive plant in Hennigsdorf (Fabriken Hennigsdorf) became a Volkseigener Betrieb (VEB) (people owned enterprise) as the Lokomotivbau Elektrotechnische Werke (LEW) ("electric locomotive works"). The cable plant (Draht-, Kabel- und Metallwerk Oberspree) and apparatus factory (Apparatefabrik Treptow) and other facilities also lay in East Germany and became Sowjetische Aktiengesellschaft (SAG) (Soviet joint stock companies). Over 90% of assets in Berlin lay in the Russian occupied zone and were lost. The headquarters for the non-expropriated parts of the company was moved first to Hamburg and then finally to Frankfurt am Main, the headquarters in Berlin having been destroyed. 1948 - The AEG factories Kassel (FK) were founded on the site of the former MWK Motorenbau Werk Kassel at Lilienthalstrasse 150 in Kassel/Hesse/Germany. The first factory part was the high voltage switchgear factory (HSF), later the refrigerator factory (KSF), the ticketprinter factory (FDF), the isolating material factory (IF) as well as the worldwide accepted high voltage institute (HI)were founded. In the early sixties more than 5000 people worked for AEG in Kassel. Today, the site Lilienthalstrasse still produces high voltage switchgear. 1950 - The new corporate headquarters is at the Friedensbrücke (Peace Bridge) in Frankfurt / Main. The number of employees in the Group rose from 20,900 in September 1948 to 55,400 persons in September 1957. In the same year the turnover exceeded one billion DM for the first time, however the high level of investment in the rebuilding of the company (1948 to 1956 over 500 million DM) placed a considerable strain on the balance sheet. 1962 The Group has 127,000 employees and generates annual sales of 3.1 billion DM. In Springe a new factory is opened in February 1962 a new factory for the production of fluid control units with 200 employees. 1962 Walter Bruch at Telefunken in Hannover develops PAL TV color. 1966 The largest industrial space in Europe is created (175 m long, 45 meters wide and 26 meters high) for the construction using cranes of engines and generators with weights up to 400 tonnes. Robert Kennedy attends the opening. 1 January 1967 - Merger with Telefunken creates AEG-Telefunken, headquartered in Frankfurt am Main. In August 1982 a restructuring plan, backed with federal guarantees of 600 million DM and new bank loans of 275 million DM, fell apart at the first disagreement between the banks. A banking consortium provided an administrative loan of DM 1.1 billion to the AEG Group until June 1983; 400 million of which only to be available on a guarantee by the federal government. Not only is AEG-Telefunken AG affected, but also its subsidiaries Küppersbusch AG in Gelsenkirchen, Hermann Zanker Maschinenfabrik GmbH & Co. KG in Tübingen and Carl Neff GmbH in Bretten. The Alno-Möbelwerke GmbH & Co. KG in Pfullendorf was taken over by the minority shareholders, and separated from the group. The suppliers to AEG were affected and some filed for bankruptcy - including Becher & Co. Möbelfabriken KG in Bühlertann with lack of continuity of company policy a factor. The site at Brunnenstraße in the former Berlin district of Wedding was also sold, as were the firms AEG-Fabrik Essen and Bauknecht. 1983/84 the consumer electronics division (Telefunken television and broadcasting GmbH) was sold to the French group Thomson-Brandt. 1985 AEG is taken over by Daimler-Benz AG. Daimler-Benz executive Edzard Reuter (from 1987 Daimler CEO), decides two companies should form an "integrated technology group" with beneficial synergy. 1988 On its 60th year anniversary the AEG-Forschungsinstituts (AEG Research Institute) creates the Carl-Ramsauer Prize for scientific/technical dissertations. 1990 AEG Westinghouse Transportation Systems GmbH is formed in association with Westinghouse Transportation Systems Inc.
1992 The Swedish company Atlas Copco acquires AEG Power Tools Ltd - divested in 2004 to Techtronic Industries. 1994 sale of the Automation division to Schneider Electric and of AEG Hausgeräte AG to Electrolux. 1995 AEG Schienenfahrzeuge GmbH becomes part of ABB Daimler-Benz Transportation (Adtranz) (subsequently becoming part of Bombardier Transportation in 2001). 1996 The Annual General Meeting of Daimler-Benz AG chaired by Juergen Schrempp decides upon the dissolution of the lossmaking group. 1996 GEC ALSTHOM acquires AEG Power T&D business September 1996 The company is deleted from the commercial register. AEG electric locomotive. AEG played an important role in the history of the German railways - the company was involved on the development and manufacture of the electrical parts of almost all German electric locomotive series and contributed to the introduction of electrical power in Germany railways. Additionally many steam locomotives were made in AEG factories. In 1931 the company acquired Borsig and transferred the locomotive production to the AEG-Borsig works (Borsig Lokomotiv-Werke GmbH) from the Borsig plant in Tegel. In 1948 the plant became VEB Lokomotivbau Elektrotechnische Werke. In addition to numerous electric locomotives produced for the DR steam locomotive production continued until 1954. When the Federal Republic of Germany began implementing AC propulsion systems AEG found itself in competition with Brown, Boveri & Cie. The prototype DB Class E320 was built with Krupp as dual voltage (15 kV and 25 kV AC) test machine, the technology ultimately leading to locomotives such as DB Class 120 and ICE 1. Only after German reunification and the adoption of the LEW plant in Hennigsdorf did AEG's name return to whole locomotive manufacturing, but only for a short time. "AEG locomotives GmbH " became part of ABB Daimler-Benz Transportation (later ADtranz) and currently the technology developed in the past, in part, now enables Bombardier Transportation to build the very successful TRAXX series of locomotives. AEG G.IV bomber (World War I). see also List of AEG aircraft Additionally, AEG manufactured a range of aircraft from 1910 to 1918. The first aircraft in 1912 was of wooden construction and modelled after the biplane of the Wright brothers. It had a wingspan of 17.5 m (57 ft); was powered by an eight-cylinder engine producing 75 hp; unloaded weight was 850 kg; and could attain a speed of 65 km/h (40 mph). From 1912, the construction of airplanes in mixed wood and steel tube construction with fabric covering. One of the planes designed and built was Riesenflugzeug ("giant aircraft") AEG R.I. This aircraft was powered by four 260 hp (190 kW) Mercedes D.IVa engines linked to a combination leather cone and dog clutch. The first flight tests were satisfactory, but on September 3, 1918 the R.I broke up in the air killing its seven crewmen. During the Second World War AEG produced machines for reconnaissance purposes, including a helicopter platform driven by an AC motor, the power supply was carried by three cables from the ground, this was a tethered craft - the machine could not fly freely. The machine reached an altitude of 300 m.